In a certain village in La Mancha , which I do not wish to name, there lived not long ago a gentleman – one of those who have always a lance in the rack, an ancient shield, a lean hack and a greyhound for coursing. His habitual diet consisted of a stew, more beef than mutton, of hash most nights, boiled bones on Saturdays, lentils on Fridays, and a young pigeon as a Sunday treat; and on this he spent three-quarters of his income. The rest of it went on a fine cloth doublet, velvet breeches and slippers for holidays, and a homespun suit of the best in which he decked himself on weekdays. His household consisted of a house-keeper of rather more than forty, a niece not yet twenty, and a lad for the field and market, who saddled his horse and wielded the pruning-hook. Our gentleman was verging on fifty, of tough constitution, lean-bodied, thin-faced, a great early riser and a lover of hunting. They say that his surname was Quixada or Quesada – for there is some difference of opinion amongst authors on this point. However, by very reasonable conjecture we may take it that he was called Quexana. But this does not much concern our story; enough that we do not depart by so much as an inch from the truth in the telling of it. These writings drove the poor knight out of his wits; and he passed sleepless nights trying to understand them and disentangle their meaning, though Aristotle himself would never have unravelled or understood them, even if he had been resurrected for that sole purpose. He did not much like the wounds that Sir Belianis gave and received, for he imagined that his face and his whole body must have been covered with scars and marks, however skilful the surgeons who tended him. But, for all that, he admired the author for ending his book with the promise to continue with that interminable adventure, and often the desire seized him to take up the pen himself, and write the promise sequel for him. No doubt he would have done so, and perhaps successfully, if other greater and more persistent preoccupations had not prevented him. Often he had arguments with the priest oh his village, who was a scholar and a graduate of Siguenza, as to which was the better knight – Palmerin of England or Amadis of Gaul. But Master Nicholas, the barber of that village, said that no one could compare with the Knight of the sun. Though if anyone cpuld, it was Sir Galaor, brother of Amadis of Gaul. For he had a very accommodating nature, and was not so affected nor such a sniveller as his brother, though he was not a bit behind him in the matter of bravery. 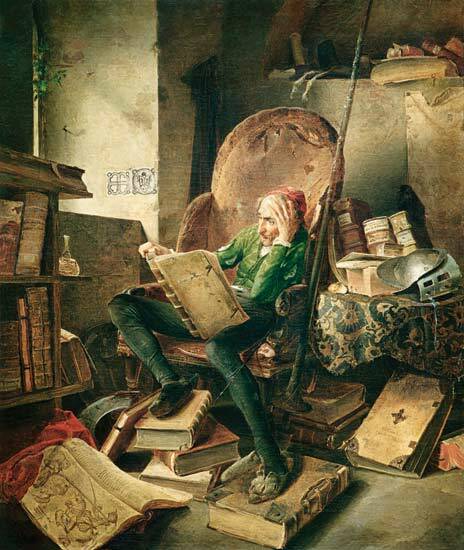 In short, he so buried himself in his books that he spent the nights reading from twilight till daybreak and the ways from drawn till dark; and so from little sleep and much reading, his brain dried up and he lost his wits. He filled his mind with all that he read in them, with enchantments, quarrels, battles, challenges, wounds, wooings, loves, torments and other impossible nonsense; and so deeply did he steep his imagination in the belief that all the fanciful stuff he read was true, that to his mind no history in the world was more authentic. He used to say that the Cid Ruy Diaz must have been a very good knight, but that he could not be compared to the Knight of the Burning Sword, who with a single backstroke had cleft a pair of fierce and monstrous giants in two. And he had an even better opinion of Bernardo del Carpio for slaying the enchanted Roland at Roncesvalles, by making use of Hercules´ trick when he throttled the Titan Antaeus in his arms. He spoke very well of the giant Morgante; for, though one of that giant brood who are all proud and insolent, he alone was affable and well-mannered. But he admired most of all Reynald of Montalban, particularly when he saw him sally forth from his castle and rob everyone he met, and when in heathen lands overseas he stole that idol of Mahomet, which history says was of pure gold. But he would have given his housekeeper and his niece into the bargain, to deal the traitor Galaon a good Kicking. In fact, now that he had utterly wrecked his reason he fell into the strangest fancy that ever a madman had in the whole world. He thought it fit and proper, both in order to increase his renown and to serve the state, to turn knight errant and travel through the world with horse and armour in search of adventures, following in every way the practice of the knights errant he had read of, redressing all manner of wrongs, and exposing himself to chances and dangers, by the overcoming of which he might win eternal honour and renown. Already the poor man fancied himself crowned by the valour of his arm, at least with the empire of Trebizond; and so, carried away by the strange pleasure he derived from these agreeable thoughts, he hastened to translate his desires into action. The first thing he did was to clean some armour which had belonged to his ancestors, and had lain for ages forgotten in a corner, eaten with rust and covered with mould. But when he had cleaned and repaired it as best he could, he found that there was one great defect: the helmet was a simple head-piece without a visor. So he ingeniously made good this deficiency by fashioning out of pieces of pasteboard a kind of half-visor which, fitted to the helmet, gave the appearance of a complete head-piece. However, to see if it was strong enough to stand up to the risk of a sword-cut, he took out his sword and gave it two strokes, the first of which demolished in a moment what had taken him a week to make. He was not too pleased at the ease with which he had destroyed it, and to safeguard himself against this danger, reconstructed the visor, putting some strips of iron inside, in such a way as to satisfy himself of his protection; and, not caring to make another trial of it, he accepted it as a fine jointed headpiece and put it into commission. Next he went to inspect his hack, but though, through leanness, he had more quarters than there are pence in a groat, and more blemishes than Gonella´s horse, which was nothing but skin and bone, he appeared to our knight more than the equal of Alexander´s Bucephalus and the Cid´s Babieca. He spent four days pondering what name to give him; for, he reflected, it would be wrong for the horse of so famous a knight, a horse so good in himself, to be without a famous name. Therefore he tried to fit him with one that would signify what he had been before his master turned knight errant, and what he know was; for it was only right that as his master changed his profession, the horse should change his name for a sublime and high-sounding one, befitting the new order and the new calling he professed. So, after many names invented, struck out and rejected, amended, cancelled and remade in his fanciful mind, he finally decided to call him ROCINANTE, a name which seemed to him grand and sonorous, and to express the common horse he had been before arriving at his present state: the first and foremost of all hacks in the world. Having found so pleasing a name for his horse, he next decided to do the same for himself, and spent another eight days thinking about it. Finally he resolved to call himself DON QUIXOTE. And that is no doubt why the authors of this true history, as we have said, assumed that his name must have been Quixada and not Quesada, as other authorities would have it. Yet he remembered that the valorous Amadis had not been content with his bare name, but had added the name of his kingdom and native country in order to make it famous, and styled himself Amadis of Gaul. So, like a good knight, he decided to add the name of his country to his own and call himself DON QUIXOTE DE LA MANCHA. Thus, he thought, he very clearly proclaimed his parentage and native land and honoured it by taking his surname from it. Now that his armour was clean, his helmet made into a complete head-piece, a name found for his horse, and he confirmed in his new title, it struck him that there was only one more thing to do: to find a lady to be enamoured of. For a knight errant without a lady is like a tree without leaves or fruit and a body without a soul. He said to himself again and again: “If I for my sins or by good luck were to meet with some giant hereabouts, as generally happens to knights errant, and if I were to overthrow him in the encounter, or cut him down the middle or, in short, conquer him and make him surrender, would it not be well to have someone to whom I could send him as a present, so that he could enter and kneel down before my sweet lady and say in tones of humble submission: “Lady, I am the giant Caraculiambro, lord of the island of Malindrania, whom the never-sufficiently-to-be-praised knight, Don Quixote de la Mancha, conquered in single combat and ordered to appear before your Grace, so that your Highness might dispose of me according to your will?” Oh, how pleased our knight was when he had made up this speech, and even gladder when he found someone whom he could call his lady. It happened, it is believed, in this way: in a village near his there was a very good-looking farm girl, whom he had been taken with at one time, although she is supposed not to have known it or had proof of it. Her name was Aldonza Lorenzo, and she it was he thought fit to call the lady of his fancies; and, casting around for a name which should not be too far away from her own, yet suggest and imply a princess and great lady, he resolved to call her DULCINEA DEL TOBOSO – for she was a native of El Toboso – a name which seemed to him as musical, strange and significant as those others that he had devised for himself and his possessions. Here is a fantastic facsimile of Don Quixote from the Spanish Library. Imaginábase el pobre ya coronado por el valor de su brazo por lo menos del imperio de Trapisonda: y así con estos tan agradables pensamientos, llevado del estraño gusto que en ellos sentía, se dió priesa a poner en efecto lo que deseaba. Y lo primero que hizo, fue limpiar unas armas, que habían sido de sus bisabuelos, que, tomadas de orín y llenas de moho, luengos siglos había que estaban puestas y olvidadas en un rincón. Limpiólas y aderezólas lo mejor que pudo; pero vió que tenían una gran falta, y era que no tenía celada de encaje, sino morrión simple; mas a esto suplió su industria, porque de cartones hizo un modo de media celada, que encajada con el morrión, hacía una apariencia de celada entera. Es verdad que para probar si era fuerte, y podía estar al riesgo de una cuchillada, sacó su espada, y le dió dos golpes, y con el primero y en un punto deshizo lo que había hecho en una semana: y no dejó de parecerle mal la facilidad con que la había hecho pedazos, y por asegurarse de este peligro, lo tornó a hacer de nuevo, poniéndole unas barras de hierro por de dentro de tal manera, que él quedó satisfecho de su fortaleza; y, sin querer hacer nueva experiencia de ella, la diputó y tuvo por celada finísima de encaje. Fue luego a ver a su rocín, y aunque tenía más cuartos que un real, y más tachas que el caballo de Gonela, que tantum pellis, et ossa fuit, le pareció que ni el Bucéfalo de Alejandro, ni Babieca el del Cid con él se igualaban. Cuatro días se le pasaron en imaginar qué nombre le podría: porque, según se decía él a sí mismo, no era razón que caballo de caballero tan famoso, y tan bueno él por sí, estuviese sin nombre conocido; y así procuraba acomodársele, de manera que declarase quien había sido, antes que fuese de caballero andante, y lo que era entones: pues estaba muy puesto en razón, que mudando su señor estado, mudase él también el nombre; y le cobrase famoso y de estruendo, como convenía a la nueva orden y al nuevo ejercicio que ya profesaba: y así después de muchos nombres que formó, borró y quitó, añadió, deshizo y tornó a hacer en su memoria e imaginación, al fin le vino a llamar ROCINANTE, nombre a su parecer alto, sonoro y significativo de lo que había sido cuando fue rocín, antes de lo que ahora era, que era antes y primero de todos los rocines del mundo. Puesto nombre y tan a su gusto a su caballo, quiso ponérsele a sí mismo, y en este pensamiento, duró otros ocho días, y al cabo se vino a llamar DON QUIJOTE, de donde como queda dicho, tomaron ocasión los autores de esta tan verdadera historia, que sin duda se debía llamar Quijada, y no Quesada como otros quisieron decir. Pero acordándose que el valeroso Amadís, no sólo se había contentado con llamarse Amadís a secas, sino que añadió el nombre de su reino y patria, por hacerla famosa, y se llamó Amadís de Gaula, así quiso, como buen caballero, añadir al suyo el nombre de la suya, y llamarse DON QUIJOTE DE LA MANCHA, con que a su parecer declaraba muy al vivo su linaje y patria, y la honraba con tomar el sobrenombre della. Limpias, pues, sus armas, hecho del morrión celada, puesto nombre a su rocín, y confirmándose a sí mismo, se dio a entender que no le faltaba otra cosa, sino buscar una dama de quien enamorarse, porque el caballero andante sin amores, era árbol sin hojas y sin fruto, y cuerpo sin alma. Decíase él: si yo por malos de mis pecados, por por mi buena suerte, me encuentro por ahí con algún gigante, como de ordinario les acontece a los caballeros andantes, y le derribo de un encuentro, o le parto por mitad del cuerpo, o finalmente, le venzo y le rindo, ¿no será bien tener a quién enviarle presentado, y que entre y se hinque de rodillas ante mi dulce señora, y diga con voz humilde y rendida: yo señora, soy el gigante Caraculiambro, señor de la ínsula Malindrania, a quien venció en singular batalla el jamás como se debe alabado caballero Don Quijote de la Mancha, el cual me mandó que me presentase ante la vuestra merced, para que la vuestra grandeza disponga de mí a su talante? ¡Oh, cómo se holgó nuestro buen caballero, cuando hubo hecho este discurso, y más cuando halló a quién dar nombre de su dama! Y fue, a lo que se cree, que en un lugar cerca del suyo había una moza labradora de muy buen parecer, de quien él un tiempo anduvo enamorado, aunque según se entiende, ella jamás lo supo ni se dió cata de ello. Llamábase Aldonza Lorenzo, y a esta le pareció ser bien darle título de señora de sus pensamientos; y buscándole nombre que no desdijese mucho del suyo, y que tirase y se encaminase al de princesa y gran señora, vino a llamarla DULCINEA DEL TOBOSO, porque era natural del Toboso, nombre a su parecer músico y peregrino y significativo, como todos los demás que a él y a sus cosas había puesto.